There’s still time to submit your grant! Police & Fire Departments: The Ben Roethlisberger Foundation at The Giving Back Fund is accepting requests for grants for the 2014-2015 grant cycle. “Welcome SANTO to our department. 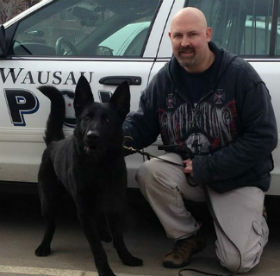 Ofc Shawn Fritsch picked him up from Denver, Indiana, Von Liche Kennels on Sunday. Thanks to the Ben Roethlisberger Foundation for the funding to help improve our community.” – Posted by the Wausau (MI) Police Department on their official Facebook page, March 26, 2014. This marks the eighth grant cycle for the Ben Roethlisberger Foundation. The majority of the grants distributed will help K-9 units to purchase dogs and dog safety vests, but other types of needs are also considered. Ben’s foundation will be distributing grants in the cities and surrounding communities of each regular season away game for the Steelers during the 2014 NFL season. He is inviting police and fire departments in these eight cities to submit proposals detailing their needs. Also, for each Steelers’ appearance in a playoff game, a grant will be awarded to a non-NFL market city anywhere in the United States that would not otherwise be eligible to apply. In addition, the Foundation will continue to make grants to several police and fire department K-9 units in the Pittsburgh area following Super Bowl XLIX. *Eligible departments must apply to The Giving Back Fund by August 15, 2014. You can view the full grant requirements, eligibility and evaluation process, please visit http://www.givingback.org/documents/RFP_2014_BRF_app.pdf. And you can enjoy more photos in the Ben Roethlisberger Foundation album here. Ben’s foundation fundraiser in June raised more than $218,000 to help fund police and fire K9 units as well as the Make A Wish Foundation. You can pick up a copy of the August issue of WHIRL magazine to read more about Ben’s event and enjoy some great photos!